How to Have a Great Life starts with you–your strengths and amazing potential and how to develop those. It helps you understand how to tap into your ability to grow, while equipping you with insights, inspiration, and practical tools to deal with whatever life throws your way in order to achieve success and live a happy and fulfilled life. You already have many of the tools you need to succeed–you just need to know which ones to use and how best to use them. 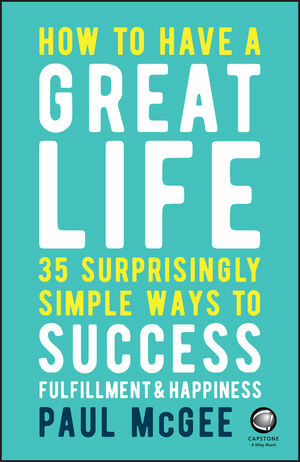 With no-frills, funny, and emotionally intelligent advice, Paul McGee will make you think, make you laugh, and make you take action to live your greatest life possible. We are living faster and more frantic lives than ever before—and there’s no time like the present to catch your breath and live your best life possible. Paul McGee is an international keynote speaker and performance coach, combining his background in psychology with large doses of humour and practical insights. He is Managing Director of his own training and education company and proud creator of SUMO (Shut Up & Move On). He has spread the word about SUMO in over 30 countries and expanded the brand into the public, private and education sectors. Paul has a diploma in Performance Coaching and counselling and is an associate of the Chartered Institute of Personnel and Development. 7. Are You Failing Any of the 7 Cs? Want Paul to Speak for Your Organization?